A man convicted of kidnapping and robbery in the 1990s was arrested for allegedly posing as a livery cab driver and assaulting a mother and two of her young children before hitting the youngest with the door of his fleeing car after driving them to a Queens homeless shelter, authorities say. Pedro Vargas, 48, faces charges of misdemeanor assault, two counts of felony assault and three counts of endangering the welfare of a child after the alleged attacks outside the shelter that sits on the site of the former Pan Am Hotel in Elmhurst, prosecutors say. Vargas, of Yonkers, was arrested late Thursday, four days after a man claiming to be a cab driver picked up a 26-year-old mother and her three kids -- ages 1, 3, and 5 -- and said he would drive them to the shelter. The man drove them around the back of the building and started to assault the family. The attack was captured by surveillance cameras. 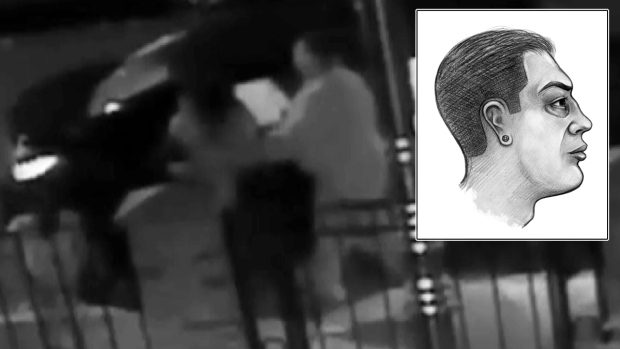 Footage shows the man, allegedly Vargas, hurl the 3-year-old child from the back of the cab to the sidewalk, then elbow the 5-year-old, forcing her to the ground. Prosecutors allege the man then fought with the mother as she held her 1-year-old child in her arms, and the 1-year-old fell to the sidewalk. The man allegedly then got back into his car and sped off with the front passenger door still open; the car door hit the 1-year-old as the man drove away. This is surveillance footage from the scene where a driver allegedly tried to sexually assault a mother in front of her three young children. WARNING: This video may be disturbing to some. The children were taken to Elmhurst Hospital with minor injuries, including bruising and swelling. Their mother wasn't hurt. Vargas' attorney Howard Greenberg claimed the victim tried to "proposition" his client after she refused to pay the fare. "He just wanted to get rid of her and them," he told reporters. "Some of it might have been a bit somewhat of an overreaction but there's no injuries to the children. So what's the crime?" Police say Vargas was arrested 12 times between 1984 and 1994, including on kidnapping and robbery charges in Manhattan and the Bronx. He served 18 years in jail on those charges. Vargas admitted in court he did not have a license to operate a taxi.